1. Extraction- we are running out of our precious resources like trees, water and food. 2. Production- we use too much energy, add toxic chemicals that are harming us and polluting our atmosphere. 3. Distribution- we promote shopping and consumption by measuring our value based on the amount of stuff we own. 4. Dumpsites- we are filling up our landfills and releasing toxins into the air through incineration. Leonard says that "1% of the stuff we buy is still in use 6 months later." Wow, 99% of the stuff we think we need ends up getting tossed? That's a wake-up call. Another disturbing fact: manufacturers are either intentionally making products that don't last, or they are creating perceptions that the products are outdated and useless, so that we must buy new all over again. Ever noticed that refrigerators don't last as long as they did when we were kids? And think about how many times we've upgraded our phones, computers and TV's in the last few years? Did we really need to? It's definitely something to take pause over. I have been increasingly conscious of not buying things for my home just because they are are good deal. Yes, that cool retro clock may be a steal for $10 but I really don't need another clock, even if it is second-hand. That sale on pillows is amazing, but I don't have room for any pillows. Yes, it would be great to upgrade my phone for the newest model, but I really want to stop using my phone so much anyway, so why would I need an even better one? Don't get me wrong, I'm not against decorating our homes to make them comfortable and stylish. I believe we are fortunate that our circumstances grant us the luxury of making our homes comforting and a true reflection of who we are - and we should be proud of being able to do that. But the big question is... are we filling our homes and lives with stuff that's truly representative of who we are? Or are we simply filling our lives with meaningless stuff that we think will make us feel better, only to end up drowning in it? More and more, many people are finding that their consumerist tendencies have led them down the path of overwhelm which shackles them to homes full of things to take care of, clean and store. They have less time, freedom and money for the things that really matter in life. And so, if we cull down our shopping, we can help save not only the planet but a lot of money and possibly our mental health as well! OK, so how do you start living and consuming more purposefully? By simplifying, reusing and repurposing. First, learn to live with less. By living simply, with only things that are essential to your needs and comfort, you can create a home that's calming and peaceful, and a life that's more meaningful. Second, instead of buying new things for your home, make a conscious effort to reduce spending by mending and making do with what you already own, or by trading with friends or finding used items that will work. 1. Decide what you need and what your style is. Simply by figuring out the style that is most 'you' and what your essentials are for living comfortably and functionally, you'll be prepared to question every new thing you bring into your home. Do a declutter and donate things that don't fit your values or that you just don't use or love. Then, when faced with any future purchase, think about whether this new thing truly fits your style and is meaningful to living well. Learn how to do some basic sewing to fix up your own clothing when it needs to be mended. The same can be done for curtains and pillows that need hemming or fixing. Mend drawers that come apart with glue and nails, and have perfectly good appliances repaired when possible instead of buying the newest, latest model. Often times we have enough nice things to furnish and decorate our homes; we just aren't using them strategically. Need things for your walls? Look at your baskets, quilts, even interesting placemats to create unique wall art. Need more storage? Turn an under-used dining hutch into a linen closet. Don't have a nightstand for the guest room? An old dining chair or stool painted a fun colour will work well. 4. Look for vintage and antique solid wood pieces. Think about how our grandparents used to live and the fantastic furniture they had. Many of those pieces are hanging around today and are still the best quality pieces in our homes. Hang onto and cherish them. Look for tables, chairs, end tables, stools, dressers, bed frames and benches at yard and estate sales, antique markets or in your parents' attic. 5. Find thrift store accessories and fix them up. 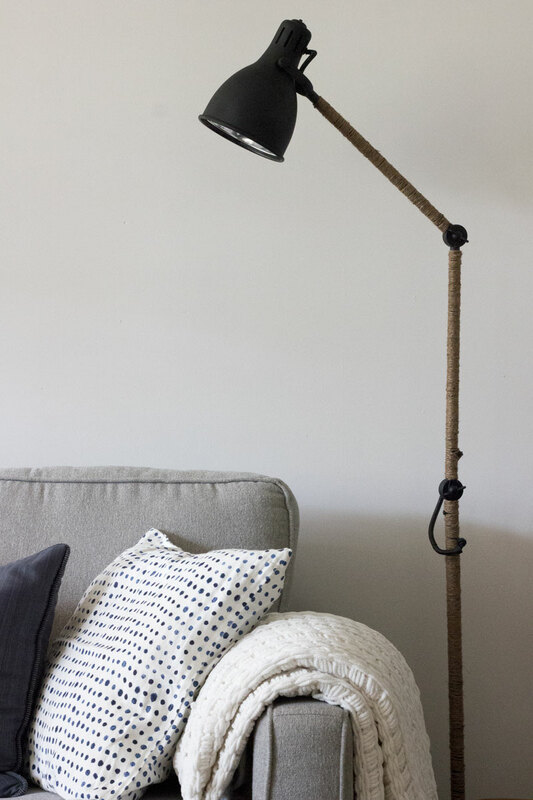 Spray paint a dated brass lamp base and recover an old shade. Find old picture frames at thrift stores or yard sales and paint them to use for DIY art of your kid's drawings. Look for kitchenware, dishes and glassware at thrift stores. 6. Choose pieces that can do double-duty. We don't have to buy as much if the things we do invest in can serve multiple purposes. A low dresser could also be used as a nightstand. A trunk for storage could serve as your coffee table. A dresser that's at arm height when standing can serve as a standing desk with a monitor on top. Wooden cutting boards can be both useful and decorative leaning against the backsplash. A mirror in the entry could also have hooks on it for hanging hats. Look for stuff outdoors to decorate sustainably. Birch branches in a corner are lovely. A stump stool made from a fallen tree in the neighborhood won't cost a cent as a new side table. Interesting rocks make for great conversation starters on your coffee table. Shells and sea glass collected and displayed in jars tell a story of where you've been. Driftwood adds texture and warmth. And of course, green plants feel luscious and inviting. When you want a change in your home decor, get creative and crafty instead of buying new décor. Cover your existing throw pillows in new fabric (yep, learning to sew will come in handy). Turn the books on your bookcase backwards for a different look (like I did). Rearrange the furniture you already have. Switch around curtains to different rooms. Move existing artwork to new spots. Recover your current headboard for a new look. Wrap tin cans with rope or other salvaged material to create pretty plant pots. The average house size in North America has doubled since the 1970's, yet we still have more stuff than we can fit inside them. We cram our garages, basements and closets full of stuff we rarely use. Let's take the time to sort out what we already have and try not to buy new when we don't have to. Let's do our part for the planet while also simplifying our own homes for better living. We can take time be be more mindful and think sustainably, and put away our wallets. Want more ideas for decorating a simple but beautiful home? Download my free guide to Essentialism at Home to learn 5 ways to create a simple, natural, beautiful home.